On November 15, 1999, between 2 and 3 in the afternoon, the planet Mercury passed between the earth and the sun. Since I had the equipment to view sunspots, this was a chance which I couldn't pass up. Even though a transit of Mercury occurs on average every 8 years or so, I had never seen one myself. 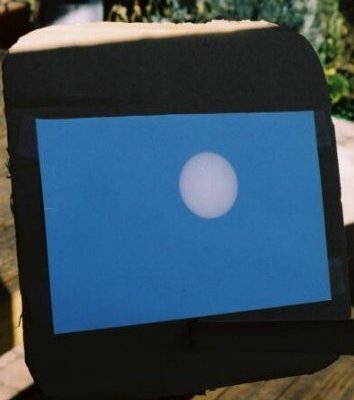 Since Mercury made only a tiny black speck on the sun's face, right near the edge, I'm sure that many children did not actually see it, but we are near the maximum of the solar cycle, so there were lots and lots of sunspots to be seen, and a good time was had by all. All about Mercury, at The Nine Planets site. Great picture at APOD, one of my favorite daily sites. They also have a very nice movie of the transit. 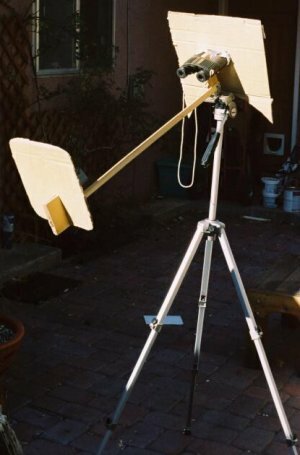 Use the sunspotter to watch the transit of Venus in 2004. 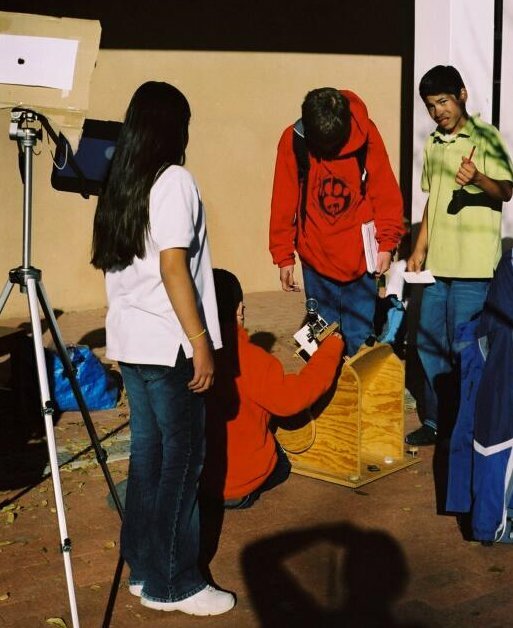 On November 8, 2006, there was another transit of Mercury, this time lasting 5 hours, and Santa Fe was ideally located to see the whole thing. We set up the sunspotter on the ground in front of the school to watch the start of the transit at lunchtime, and many kids marked Mercury and a lone sunspot on their observation cards. Then at 3PM, when school let out, many of the kids marked the new position of Mercury again. We are just coming out of a sunspot minimum, so we were lucky to have a sunspot for comparison. 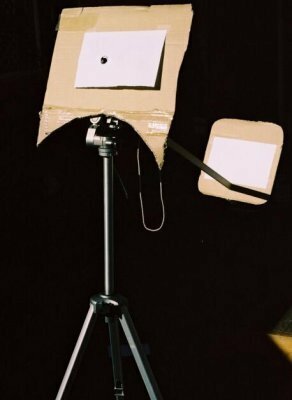 I also put together a quick-and-dirty observation unit using (half of) a pair of binoculars, plus some paper, sticks and cardboard. I protected the binoculars by covering one side completely, and the other side mostly with a sheet of paper. The 1-cm hole lets enough light through for a good-size image. Worked fine. The image was about 3 inches across, plenty big to see the sunspot and Mercury (though not visible in this photograph). 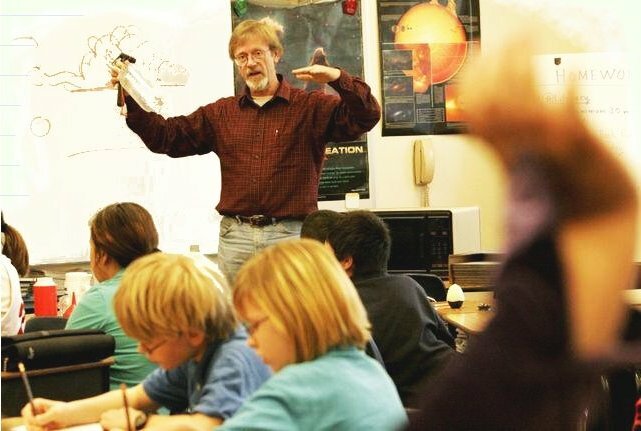 What will really happen on Y2K? last question of 1999. I told them the standard prediction, that probably there would be some glitches, nothing major etc. I decided to give them a little history of computing. 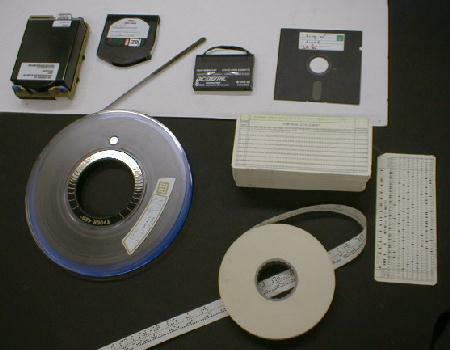 I have a growing collection of obsolete computer recording media which I brought in. 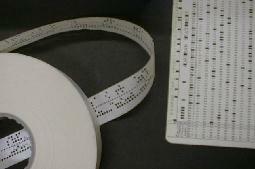 Paper tape, punch cards, big and little tapes etc. To set the scale, the deck of cards I had consists of about 400 cards, and the stack is a few inches high. An operating system today (NT 4.0) contains about 40,000,000 lines, which would make a stack 6 miles high. Of course in 1999 this fits on a hard drive the size of a pack of cigarettes. A great computer history site! Moore's Law is mentioned here, in 1965.